What is a “medicine man?” He is not a shaman, often associated with personal gain; he is not a witch doctor, associated with witchcraft. He is a traditional healer and spiritual leader among Native Americans who secures the help of the spirit world, including the Great Spirit, for the sake of healing diseases of the body as well as ailments that might occur between peoples and nature. In short, he is a man with position and power and responsibility that places him at the forefront of the cultural practices of his people, garnering respect commensurate to his duties. To paint such a noble is a prodigious task. Artist Sean Diediker has met the challenge with dignity and profundity. Recently unveiled at The Blue Poblano in Salt Lake City, the painting was also the recipient of a blessing by a contemporary medicine man. Winston Mason, of the Hidatsa Mandan in North Dakota, gave it, he says, a blessing that “it receives with it to whatever gallery it goes to, and it blesses that gallery, and eventually to whomever home it ends up in, it will bless that home also, and it will bless the artist to strive to do more, and work harder.” After the prayer, a ceremony was performed called a “smudge.” Cedar, sage, sweet grass, and tobacco were placed in an abalone shell, and the smoke emitted from the shell is directed by a collection of eagle feathers, wafts up, around, and through the artist and the painting itself, casting out any negative energy, from the mind and the body, not only from that of Diediker, but that of the man in the painting. “Medicine Man” was inspired by an antique photograph Diediker came across that reminded him of his own heritage — his grandfather established a trading post in northern New Mexico, where he and his mother’s family traded with the Navajo and, the artist says, “embraced them as their own.” As Diediker “reinvented” from this image, he was able to understand, and to feel a connection with the man he was painting from a century ago, one of the many kinds of relationships that occur between human beings, enough to paint articulately what has come to be his own signature style, having self-connected with the personal essence and philosophy of the subject. The facial features of this great man do not bear the mark of overt nobility or stature but of meekness and reticence. They are the features of a man who seeks within himself and holds troves of great wisdom. His eyes, not penetrating but astute, are captive to great secrets and a sanctity of knowledge and understanding; they do not share by their plasticity with any affectation. He is resolved within himself and knows his place and knows who he is and has nothing to prove and no show to put on by proving it. His posture also reveals his reticence. He holds himself inwardly, closing himself up. Never was there less a flaunting figure of a man, a more reserved and controlled sense of being. Simultaneously, he exudes a knowing, exudes a prodigality, exudes in his composure, a wealth of inner fire, that those among men who go to great lengths to prove themselves, will recognize and shudder from, seeing the greatness of the masterful comportment of the medicine man. The shroud, in its great graphic stripes of black and white, worn on the outside, are a symbol of the power on the inside, and it is recognized seamlessly and with great effect. Comprising the entire picture plane, with a great cloud to compare in portentousness, a small figure to the bottom right looking up as if this were a god, there is no question or doubt about just who this medicine man is. There is a delicate balance met in the humility of the medicine man; true servant of his people, channel of the elements, mediator of the Great Spirit, one who placates man and nature, and the magnificent force that he is; leader of his people, master of the elements, mouthpiece of the Great Spirit, and commander of man and nature. Diediker has painted a synergy of both aspects of the medicine man, as both aspects are veritable, real and essential. 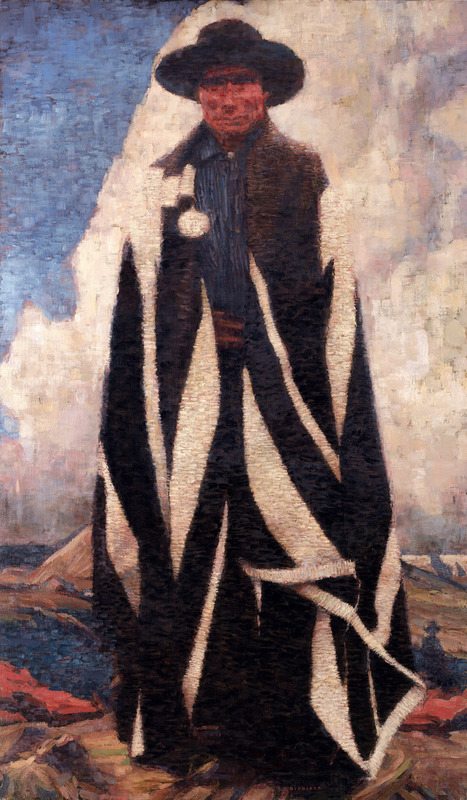 “Medicine Man” will hang in the Springville Museum of Art as part of the museum’s 29th Annual Spiritual & Religious Art of Utah exhibit, through January 18, 2015. You can learn more about the artist at diediker.com.